His tears were not for Himself, though He well knew whither His feet were tending. Before Him lay Gethsemane, the scene of His approaching agony. The sheepgate also was in sight, through which for centuries the victims for sacrifice had been led, and which was to open for Him when He should be “brought as a lamb to the slaughter.” Isaiah 53:7. Not far distant was Calvary, the place of crucifixion. Upon the path which Christ was soon to tread must fall the horror of great darkness as He should make His soul an offering for sin. Yet it was not the contemplation of these scenes that cast the shadow upon Him in this hour of gladness. No foreboding of His own superhuman anguish clouded that unselfish spirit. He wept for the doomed thousands of Jerusalem—because of the blindness and impenitence of those whom He came to bless and to save. The history of more than a thousand years of God’s special favor and guardian care, manifested to the chosen people, was open to the eye of Jesus. There was Mount Moriah, where the son of promise, an unresisting victim, had been bound to the altar—emblem of the offering of the Son of God. There the covenant of blessing, the glorious Messianic promise, had been confirmed to the father of the faithful. Genesis 22:9, 16-18. There the flames of the sacrifice ascending to heaven from the threshing floor of Ornan had turned aside the sword of the destroying angel (1 Chronicles 21)— fitting symbol of the Saviour’s sacrifice and mediation for guilty men. Jerusalem had been honored of God above all the earth. The Lord had “chosen Zion,” He had “desired it for His habitation.” Psalm 132:13. There, for ages, holy prophets had uttered their messages of warning. There priests had waved their censers, and the cloud of incense, with the prayers of the worshipers, had ascended before God. There daily the blood of slain lambs had been offered, pointing forward to the Lamb of God. There Jehovah had revealed His presence in the cloud of glory above the mercy seat. There rested the base of that mystic ladder connecting earth with heaven (Genesis 28:12; John 1:51)—that ladder upon which angels of God descended and ascended, and which opened to the world the way into the holiest of all. Had Israel as a nation preserved her allegiance to Heaven, Jerusalem would have stood forever, the elect of God. Jeremiah 17:21-25. But the history of that favored people was a record of backsliding and rebellion. They had resisted Heaven’s grace, abused their privileges, and slighted their opportunities. For centuries the Jews had vainly endeavored to show wherein the promise of God given by Haggai had been fulfilled; yet pride and unbelief blinded their minds to the true meaning of the prophet’s words. The second temple was not honored with the cloud of Jehovah’s glory, but with the living presence of One in whom dwelt the fullness of the Godhead bodily—who was God Himself manifest in the flesh. The “Desire of all nations” had indeed come to His temple when the Man of Nazareth taught and healed in the sacred courts. 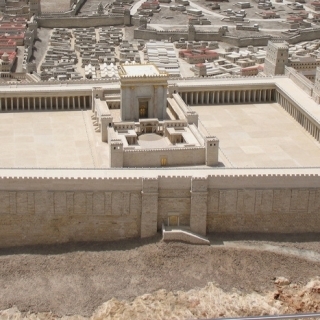 In the presence of Christ, and in this only, did the second temple exceed the first in glory. But Israel had put from her the proffered Gift of heaven. With the humble Teacher who had that day passed out from its golden gate, the glory had forever departed from the temple. Already were the Saviour’s words fulfilled: “Your house is left unto you desolate.” Matthew 23:38. The future was mercifully veiled from the disciples. Had they at that time fully comprehend the two awful facts— the Redeemer’s sufferings and death, and the destruction of their city and temple—they would have been overwhelmed with horror. Christ presented before them an outline of the prominent events to take place before the close of time. His words were not then fully understood; but their meaning was to be unfolded as His people should need the instruction therein given. The prophecy which He uttered was twofold in its meaning; while foreshadowing the destruction of Jerusalem, it prefigured also the terrors of the last great day. Signs and wonders appeared, foreboding disaster and doom. In the midst of the night an unnatural light shone over the temple and the altar. Upon the clouds at sunset were pictured chariots and men of war gathering for battle. The priests ministering by night in the sanctuary were terrified by mysterious sounds; the earth trembled, and a multitude of voices were heard crying: “Let us depart hence.” The great eastern gate, which was so heavy that it could hardly be shut by a score of men, and which was secured by immense bars of iron fastened deep in the pavement of solid stone, opened at midnight, without visible agency.—Milman, The History of the Jews, book 13. For seven years a man continued to go up and down the streets of Jerusalem, declaring the woes that were to come upon the city. By day and by night he chanted the wild dirge: “A voice from the east! a voice from the west! a voice from the four winds! a voice against Jerusalem and against the temple! a voice against the bridegrooms and the brides! a voice against the whole people!”—Ibid . This strange being was imprisoned and scourged, but no complaint escaped his lips. To insult and abuse he answered only: “Woe, woe to Jerusalem!” “woe, woe to the inhabitants thereof!” His warning cry ceased not until he was slain in the siege he had foretold. Thousands perished from famine and pestilence. Natural affection seemed to have been destroyed. Husbands robbed their wives, and wives their husbands. Children would be seen snatching the food from the mouths of their aged parents. The question of the prophet, “Can a woman forget her sucking child?” received the answer within the walls of that doomed city: “The hands of the pitiful women have sodden their own children: they were their meat in the destruction of the daughter of my people.” Isaiah 49:15; Lamentations 4:10. Again was fulfilled the warning prophecy given fourteen centuries before: “The tender and delicate woman among you, which would not adventure to set the sole of her foot upon the ground for delicateness and tenderness, her eye shall be evil toward the husband of her bosom, and toward her son, and toward her daughter, . . . and toward her children which she shall bear: for she shall eat them for want of all things secretly in the siege and straitness, wherewith thine enemy shall distress thee in thy gates.” Deuteronomy 28:56, 57. “It was an appalling spectacle to the Roman—what was it to the Jew? The whole summit of the hill which commanded the city, blazed like a volcano. One after another the buildings fell in, with a tremendous crash, and were swallowed up in the fiery abyss. The roofs of cedar were like sheets of flame; the gilded pinnacles shone like spikes of red light; the gate towers sent up tall columns of flame and smoke. The neighboring hills were lighted up; and dark groups of people were seen watching in horrible anxiety the progress of the destruction: the walls and heights of the upper city were crowded with faces, some pale with the agony of despair, others scowling unavailing vengeance. The shouts of the Roman soldiery as they ran to and fro, and the howlings of the insurgents who were perishing in the flames, mingled with the roaring of the conflagration and the thundering sound of falling timbers. The echoes of the mountains replied or brought back the shrieks of the people on the heights; all along the walls resounded screams and wailings; men who were expiring with famine rallied their remaining strength to utter a cry of anguish and desolation. “The slaughter within was even more dreadful than the spectacle from without. Men and women, old and young, insurgents and priests, those who fought and those who entreated mercy, were hewn down in indiscriminate carnage. The number of the slain exceeded that of the slayers. The legionaries had to clamber over heaps of dead to carry on the work of extermination.”—Milman,The History of the Jews, book 16. The Saviour’s prophecy concerning the visitation of judgments upon Jerusalem is to have another fulfillment, of which that terrible desolation was but a faint shadow. In the fate of the chosen city we may behold the doom of a world that has rejected God’s mercy and trampled upon His law. Dark are the records of human misery that earth has witnessed during its long centuries of crime. The heart sickens, and the mind grows faint in contemplation. Terrible have been the results of rejecting the authority of Heaven. But a scene yet darker is presented in the revelations of the future. The records of the past,—the long procession of tumults, conflicts, and revolutions, the “battle of the warrior . . . with confused noise, and garments rolled in blood” (Isaiah 9:5),— what are these, in contrast with the terrors of that day when the restraining Spirit of God shall be wholly withdrawn from the wicked, no longer to hold in check the outburst of human passion and satanic wrath! The world will then behold, as never before, the results of Satan’s rule.